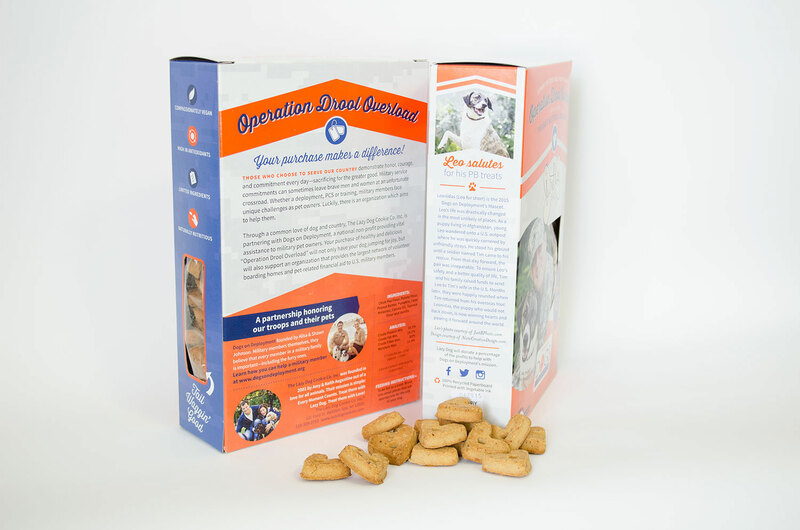 The Lazy Dog Cook­ie Co. Dog Pack­age Design for Oper­a­tion Drool Over­load, involved bring­ing an emo­tion­al reward sur­round­ing our brand expe­ri­ence and the pur­chase of this unique prod­uct. 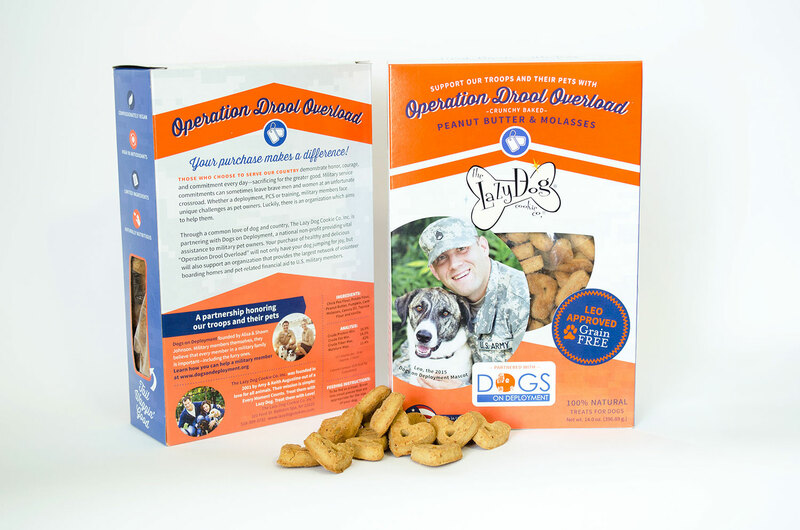 The goal was to make peo­ple feel con­nect­ed to both brands, and increase cus­tomer engage­ment when they real­ized their pur­chase made a dif­fer­ence. As a result, they would be more like­ly to con­tin­ue to choose Lazy Dog Cook­ie Co. over the next healthy prod­uct that doesn’t help to a non-prof­it. 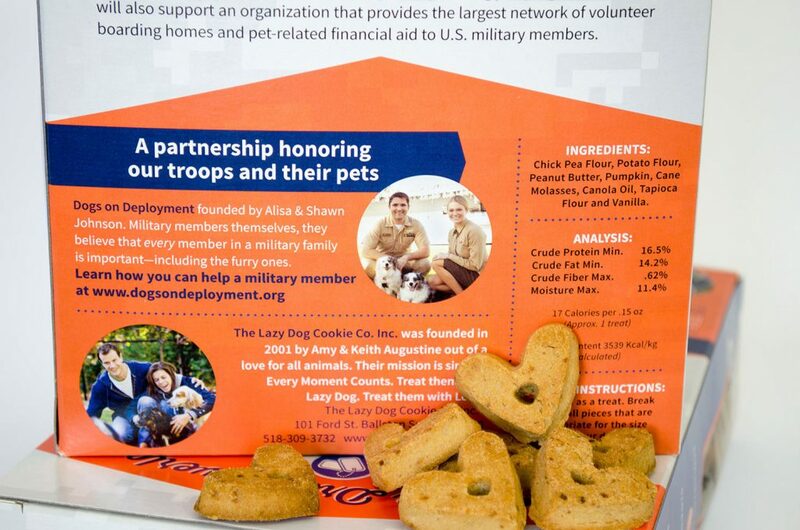 Based on our research, there is no dog treat pack­ag­ing that includes a mil­i­tary mem­ber in their pho­tographs. We real­ized imple­ment­ing this will give the design a strong visu­al dif­fer­en­ti­a­tion point. We also learned that Orange would be more like­ly to stand out over the sat­u­rat­ed vari­ety of pack­ag­ing col­ors in the indus­try. Con­sid­er­ing shelf place­ment, we need it to be eye-catch­ing. 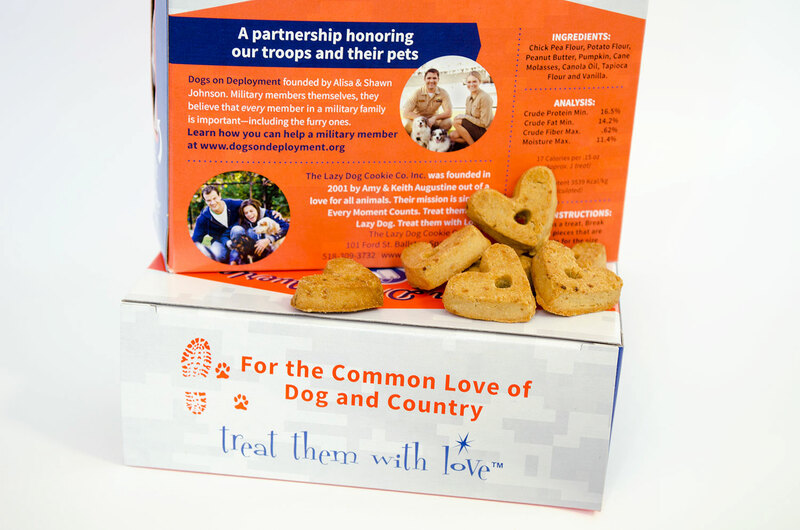 Oth­er than Orange being part of Dogs on Deployment’s brand, it’s also a vibrant col­or that com­mu­ni­cates hap­pi­ness, opti­mism and good-nature. The front of the pack­age is meant to grab atten­tion. Between brand ele­ments, pho­tog­ra­phy and key copy, we want­ed to peak the inter­est of the consumer—both new and cur­rent. 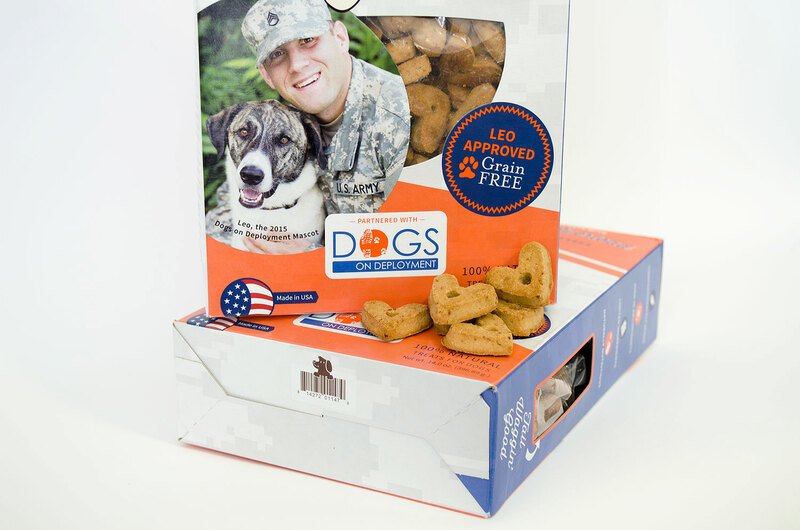 Some design struc­ture was ref­er­enced to the orig­i­nal Lazy Dog Cook­ie Co. pack­ag­ing to ensure that cur­rent con­sumers rec­og­nized their brand. The back of the pack­age was designed on the intent to “seal the deal” and make the con­sumer place it in the shop­ping cart. We want­ed to show the unique val­ue of the part­ner­ship and how the con­sumer would have a hand at mak­ing a difference—not just for the health of their pet, but in the lives of mil­i­tary men and women. TEAM INVOLVED: Con­cept + Design: Nicte Cre­ative Design, Copy: Nicte Cre­ative Design, Alisa John­son, Deb­bie Gaskell and Kei­th Augus­tine.